Encuentra tu papel fotográfico Canson Infinity. En Totenart tenemos la gama completa de Papeles Canson Infinity Edition Etching Rag para impresión digital. Infinity Edition Etching Rag, 310 gr., A4, caja 25 uds. Infinity Edition Etching Rag, 310 gr., A3, caja 25 uds. 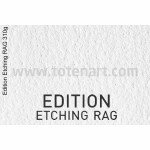 Infinity Edition Etching Rag, 310 gr., Rollo 0,61x3,05 mts. Infinity Edition Etching Rag, 310 gr., A3+, caja 25 uds. Infinity Edition Etching Rag, 310 gr., A2, caja 25 uds. Infinity Edition Etching Rag, 310 gr., Rollo 0,432x15,24 mts. Infinity Edition Etching Rag, 310 gr., Rollo 0,61x15,24 mts. Infinity Edition Etching Rag, 310 gr., Rollo 0,914x15,24 mts. Infinity Edition Etching Rag, 310 gr., Rollo 1,118x15,24 mts.